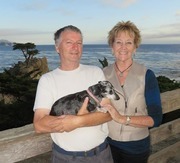 Janet Griffin, managing partner and CFO, is Phil's wife and business partner for 27 years. Her role has been to manage all finances, first for their successful restaurant in Alaska, and now for Amelia Coastal Realty. Janet's skill set lies in attending to the multitude of details inherent to any successful business. She has a BA in Elementary/Special Education from Northern Arizona University and a post graduate minor in mathematics also from NAU. She was a special ed and mathematics teacher for 7 years in Flagstaff Arizona, and 4 years in Anchorage Alaska.